Giving back to our local community is something we strive to do! 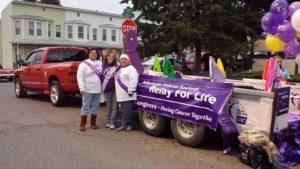 For the past 2 years we have teamed up with The American Cancer Society Relay for Life: Team CUREsaders. Originally named “Whitey’s Warriors” for Dale Whitehead, who passed in 2013 from leukemia. The team has grown at a great rate. 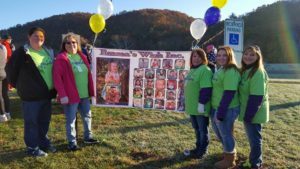 The team was started out of the love of it's family members that have been diagnosed with or passed away from some form of cancer. Today, totaling 20 members the team has adapted the name “Team CUREsaders” compiling of at least 5-10 members who have beaten and/or are currently battling cancer. The Team does numerous fundraising events throughout the year, from spirit nights and raffles to car washes and anything in between. However, they look forward to our continued support each year. Every May, we “Paint the Bottles Purple” and donate 5% of all 150mL sales to help fund this cause and find a cure. Last year we raised $900 to donate to the team. Along with our donations and their strive to succeed, the team has raised over $50,000 in the past 5 years. We want to wish all members another successful year! With you, one day WE WILL FIND the CURE!